Contrary to their marketing, digital labor schemes don’t work in spite of predicaments like the occupation or the refugee crisis - they work because of them. Graffiti on the separation wall in the West Bank, Palestine. 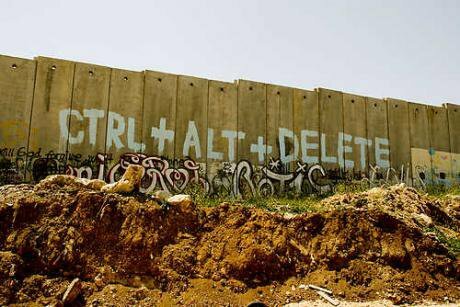 Photo by Wall in Palestine. Flickr.com (CC BY-SA 2.0) Some rights reserved.“Be yOuR OwN BosS.” Two twenty-something Palestinians are pictured leaning over an iPad and laughing: a ColourSplash™ filter makes their eyes and frayed festival wristbands glow a radioactive green. Their suits are whatever they put on that morning and their offices are wherever they turned their screens on. On a Facebook group for online freelancing work in Gaza and the West Bank, these mantras come up again and again. The idea is that regardless of your circumstances, anyone can live the hipster millennial dream and “work where they want when they want” thanks to the internet. In places like Palestine with unemployment rates of 30% (the highest in the world) and movement violently restricted by a series of checkpoints, borders and military zones, profit-making activities in the ‘placeless’ digital realm can be viewed as a way of overcoming these obstacles. The World Bank’s “m2work” project in cooperation with Nokia took precisely this approach. It was just one of a series of initiatives in the past few years led by governments or private sector actors that have identified the Arab world as a region in which microwork has “vast potential” as a means of alleviating poverty. But this rhetoric of flexibility and entrepreneurship so common to neoliberal development agendas conceals some ugly realities. “Mechanical Turk” is an example of a digital labour platform run by Amazon that draws on “human intelligence to perform tasks that computers are currently unable to do.” Microwork portals harness virtual crowds to organize playlists of music, tag videos and images, write, translate or transcribe short texts and in doing so train artificial intelligence software. Microwork is just one part of a broader spectrum of digital labour that ranges from on-demand services such as Uber to data extraction via social media such as Facebook. This continuum of unpaid, micropaid and poorly paid ‘taskified’ human activities means that work can no longer easily be distinguished from leisure time. Because of this, it’s really hard to talk about exploitation, a word usually associated with industrial labour’s sweatshop conditions, in relation to digital labour. It’s also hard to reconcile people not always feeling like these activities are work that warrants compensation with their objective creation of a great deal of economic value. But structural conditions can’t be reduced to individual pleasure or preference. Loads of studies have shown how paid digital labour platforms seriously threaten basic workers protections. While the median hourly rate on Amazon Mechanical Turk is $1.38, tasks are completed for as little as $0.01. Wage rates plummet as people around the world bid to complete tasks for cheaper and cheaper prices. Opportunities for promotion or skill-development are near non-existent as workers are unable to access information about core business processes. Bodies are also regimented to the demands of capital in new ways to the physical discipline of the factory. Refugees in Lebanon’s Shatila camp who engage in a range of digital labour activities from freelance programming to online games with virtual currencies are forced to adjust their sleeping patterns to the demands of (western) capital. Teenagers keep their phone buzzers on loud while they sleep in order to respond at any hour or consume endless energy drinks to work or play through the night. Other studies of micro-workers around the world or “gold-farmers” in China have shown how these activities result in repetitive strain injuries or severe eye problems. Crucially, there are no opportunities for collective action to resist these conditions as workers are totally isolated by the platform. Despite this, in the US there have been some creative efforts to fight back against the precarity and exploitation that define microwork. These include the ‘Dynamo’ email campaign (and quasi-union) and the FairCrowdwork monitoring system designed by IG Metall in 2015. The way in which digital platforms leverage gender, class and race disparities to extract unpaid/underpaid digital labour hasn’t been addressed by any of these campaigns. These questions are crucial to understanding the implications of the expansion of this kind of work into the Arab world. The “m2Work” project seeks to overcome “geographic obstacles” in order to offer employment opportunities to local youth and women. But this emphasis on “overcoming” geography detracts from the very real ways in which uneven global geographies of power, wealth and knowledge play out in the field of global digital labour. A study by the Oxford Internet Institute based on 60,000 anonymized transactions completed on Upwork revealed a clear neo-colonial pattern of dependence as ‘tasks’ are sold from India and the Philippines to the US, Australia or the UK. This results in the same toxic race to the bottom that has defined industrial production for the past 30 years. It is significant that the World Bank thinks that Gaza and the West Bank are “particularly relevant” destinations for microwork. In the global race to the bottom, the ‘bottom’ is an open-air prison and an area under military occupation. According to their 2014 report, these sites pose “limited risks” to employers in terms of having to pay any full time employment benefits or a minimum wage. Protections are not ‘risky.’ Making someone dependent for their survival on an algorithm with zero accountability is risky. Not paying them an adequate hourly rate to feed themselves or their family is risky. Irregular or excessive working hours resulting in repetitive strain, eye problems or insomnia are risky. The World Bank’s m2work borrows heavily from the Samasource initiative, a non-profit business that seeks to alleviate poverty by outsourcing digital work from Walmart, eBay etc. to impoverished populations. But contrary to their marketing, these schemes don’t work in spite of predicaments like the occupation or the refugee crisis - they work because of them. Like the prison industrial complex that profits off the unpaid or underpaid labour of inmates, these initiatives thrive off social and political upheaval and structural deformities in the Middle East. In many ways, digital labour plays perfectly into the logic of the refugee camp or the blockaded territory whereby subjects must be kept alive, but only just. Now, even bodies stripped of their political existence, of the rights and protections of the law, can be rendered productive. Through online platforms, residents can literally work within their figurative jail cells. Their integration into the global economy as cheap outsourcers makes users dependent not only on Israel or on a host state but on technology as well. Like the prison industrial complex that profits off the unpaid or underpaid labour of inmates, these initiatives thrive off social and political upheaval and structural deformities in the Middle East. In fact, prison labour programmes in the US now also include digital data entry, proofreading and document preparation just like the Chinese inmates “forced into gold-farming” on Massive Multiplayer Online Games. As Sarah T. Roberts argues in "Behind the screen: The hidden digital labor of commercial content moderation”, a platform called ‘MicroSourcing’ uses the fact that “virtual captives” will perform the work of western companies as a selling point on their website. Toufic Haddad has coined the term “Palestine Ltd” to describe the series of western donor policies based on the premise that “the market’s invisible hand will guide Israelis and Palestinians to peace.” Palestine has become a very profitable business for a number of investors from donors to western states. The m2work project is only the latest manifestation of the World Bank’s priority to encourage private-sector growth as the path to Palestinian state-building since the 1990s. But this willfully ignores the political realities of settler-colonialism. Last year, the UN found that the Palestinian economy would be at least twice as large if the Israeli occupation was lifted. The ‘Mechanical Turk’ was originally an 18th century Chess Player Automaton secretly operated inside by a real person. With his turban and curled mustache, this pipe-smoking ‘Turk’ was part of a craze for automata designed to resemble the oriental “Other” based on the trope in Christian theology of the docile and obedient Muslim. As workers in impoverished areas, from Syrian refugee camps to the Palestinian occupied territories, are forced to perform these repetitive, unskilled tasks, (concealed behind a slick, anonymized interface) the ‘muslim-as-machine’ trope takes on new meanings. Machine-like, always-on, this “surplus population” can always be tapped into by companies to fuel the 24-hour business cycle that drives western progress.